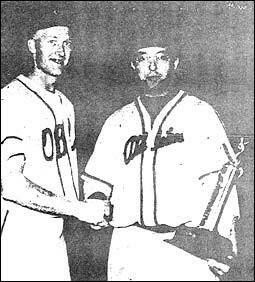 Top left - Right-hander Larry Jordan of the Penticton Athletics. 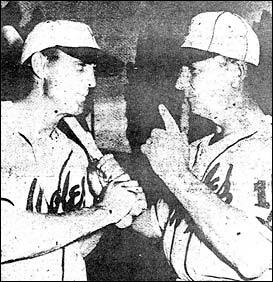 Top right - Kelowna Orioles' first baseman Hank Tostenson (left) and field manager Rudy Kitsch in discussion. 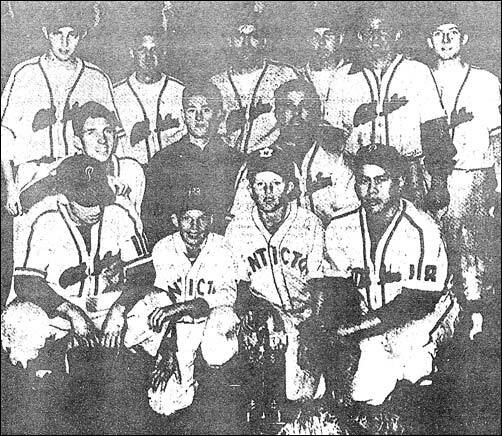 Below - Penticton Athletics following their victory in the 1954 playoff final against Oliver. The playoff champion Penticton Athletics lineup for a victory photograph minutes after handing Oliver a resounding 21-3 defeat at King's Park. 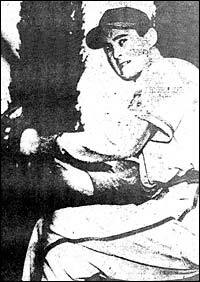 Front row (left to right) - Gordie Jones, batboys Billy Allercott and Allan Richards, and Elmer Mori. 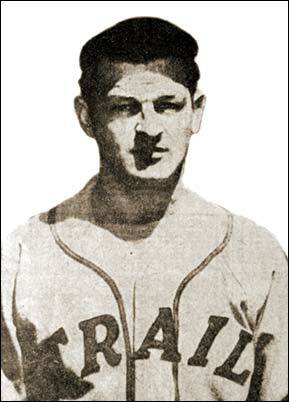 Second row - Lloyd Burgart, Larry Jordan, Sam Drossos. Standing - George Drossos, Aubrey Powell, Bill Raptis, Joe Posnikoff, Johnny Apolzer and Doug Moore. Manager Les Edwards is not shown.